Apple picking season is here and what better way to decorate your home than with a dried magnolia wreath with accents of apples, pinecones, oak leaves, pomegranates and birch from the Magnolia Company. Step into fall with a rich array of bright autumn leaves and accents against our dried magnolia leaves that have been cut fresh from the farm and then dried. Full with Autumn’s bounty, this collection features mini pumpkins, apples, broomcorn and fall leaves, as well as magnolia pods gathered from the farm. Nature’s bounty with spicy red chilies on a magnolia wreath, perfect for that culinary lover. Features spicy red chilies, pomegranates, green artichokes, lichens, rust colored grasses and magnolia pods. This dried wreath is designed to give culinary inspiration, perfect for every chef enthusiast in your life. This fall dried magnolia wreath is formed from the copper sides of the leaves and is accented with bright fall leaves and pinecones for a beautiful twist this autumn season. This Fall Fusion wreath overflows with preserved magnolia, burnt orange grasses, preserved red oak lotus pods, and pomegranates to create a masterpiece of seasonal elements by the Magnolia Company. Gorgeous hues of golden hydrangeas, yarrow and wheat mingle with vibrant aubergine celosia to create our most stunning dried magnolia wreath yet! Chocolate canella berries and lotus pods add depth while mini pumpkins add a festivity to this harvest season. A beautiful way to welcome fall is with this warm bouquet of dried sunflowers and magnolia grown on the family farm and dried to perfection! Artichokes, dried autumn flowers and lotus pods intermingle among magnolia leaves to create a stunning wreath! The fully covered lacquered front and back side of these leaves create vibrant green and copper colored magnolias. 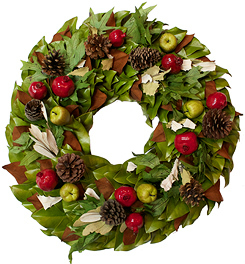 The lacquered leaves preserve the wreaths longer. Magnolia branches cut from the family farm, hand-made into a wreath, and dried to perfection create the perfect backdrop for these pink accents. One of our very favorites!! Dried magnolia leaves from the family farm create a beautiful backdrop for merlot celosia, artichokes, lotus pods and hydrangeas. Setaria, mini pumpkins and fall leaves complete this beautiful dried magnolia perfect perfect for this fall season! This gorgeous and lush Merlot Valley Wreath by The Magnolia Company has a matching mantelpiece, both share the lush richness of fall colors and natural elements. This beautiful magnolia wreath features vibrant pomegranates and plum foliage, dried garden hydrangeas and artichokes with natural lotus pods complete this stunning dried wreath for fall. 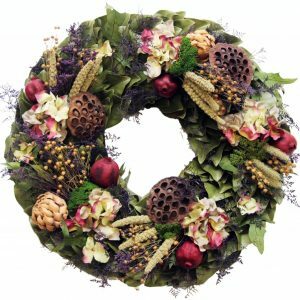 This stunning wreath evokes a feeling of peaceful beauty with its attractive use of color and texture. 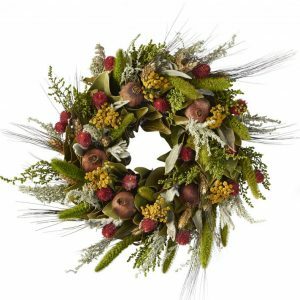 Set on a natural twig base, this wreath uses dried magnolia, Sweet Annie, Lamb’s Ears, mini pomegranates, dried millet grass, globe amaranth, bearded wheat and tansy by the Magnolia Company. 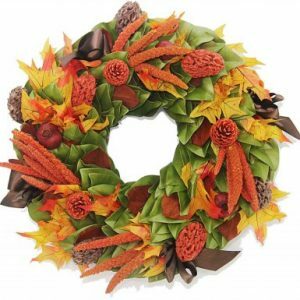 Magnolia leaves are cut off the farm from specimen magnolia trees and hand-crafted into a beautiful dried magnolia wreath that forms the base for this stunning fall wreath. Accented with wisps of reshape, quince, pinecones, broomcorn and even a few feathers are just some of the elements in this collection. Colorful turkey & pheasant feathers create this stunning dried wreath arrangement against a backdrop of dried magnolia leaves cut from the farm. A best seller! Copyright © 2019 Katzberry All Rights Reserved. Sign up to receive the latest design Ideas and Exclusive Discount Codes. Receive an immediate 10% OFF Code on signup!